What is a high school class ring? The concept of a high school class ring is pretty self-explanatory. As Google would phrase it, a class ring is a ring “worn by students and alumni to commemorate their graduation”. Of course, these rings aren’t just for high school. They can also be purchased and worn by college and university students to commemorate graduation from their schools are well. Do people still wear class rings? Absolutely! In fact, ask your parents. Chances are if they aren’t wearing it, they still have a class ring tucked away somewhere. Class rings are a classy, simple way to remember your high school experience, without going overboard. And unlike some other high school memorabilia, class rings are small enough that they can be worn anywhere without being gawky. While you might not always fit into that high school sweater, you can wear a high school ring for the rest of your life, without attracting too much attention and looking like you’re going through a mid-life crisis! Are high school class rings customizable? Absolutely! Your high school class ring can be anything you want it to be! Whether you want them to be gold, silver, simple, or full of diamonds, the choice is yours! In addition, you can include anything you want on your ring. With that being said, most rings include: Your high school name, the city your high school is located in, and the year of graduation. Many sports players or fans might choose to incorporate the name of their favourite high school sports team instead of the actual school name. Many people also like to incorporate stone cuts or gems into their rings, but some like to keep it simple and just stick with a gold or silver band. Can high school rings be worn by men too? Absolutely! In fact, there are probably more men than women who wear their class or sports rings. As we just said above, rings are completely customizable. In return, you can make them as masculine or as feminine as you like. Anyone can wear one, at any time, and at any age. What finger do you wear your class ring on? As we all know, the left ring finger is off limits – that one is set away for marriage. And if you are superstitious, wearing anything on that finger beforehand will doom you to bad luck in love. With that being said, you do have one more ring finger on your right hand, and that is the perfect place for your high school ring. Having said that, this is just a tradition and you don’t have to participate – you can wear your ring on whatever finger you want! What is the “Turning of the Ring” Ceremony? 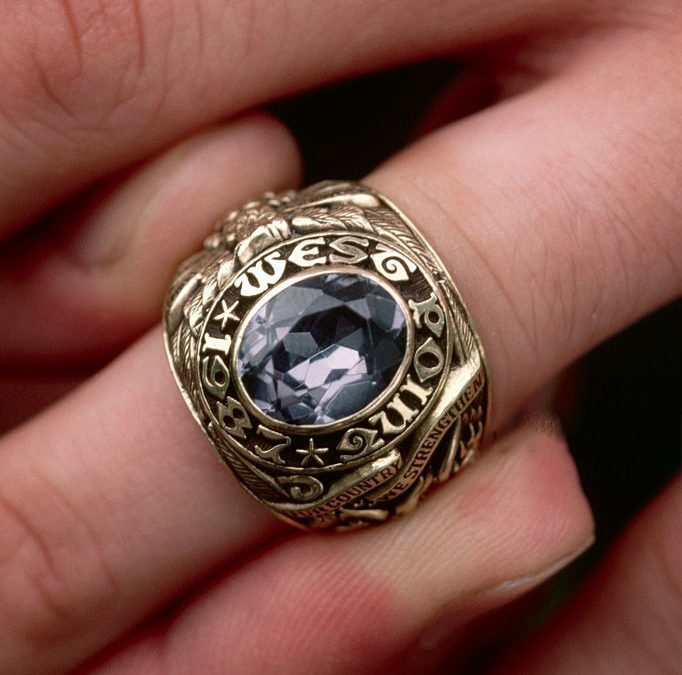 At or near commencement, many schools will hold a “Turning of the Ring” ceremony. In a turning of the ring ceremony, the ring is turned so that the name of the school is facing outwards. Not only is this is a sign of accomplishment, but it’s a sign that you have graduated and are ready to move on to your next stage in life. What if you are homeschooled? Teenagers who are home-schooled often feel left out of the whole class ring tradition. But they are not excluded! While class rings were once only for private and public school students, they can now be made for anyone – even those who are homeschooled. Instead of putting the name of your school on your ring, simply replace it with “home school” or “home education” or even “schooled by mom!” (though we don’t suggest the latter) – the skies the limit. Our parents all say it – “these are the best years of your life” – and whether you want to believe them or not, it’s true. One day you will look back on your high school years and rejoice. And while you can’t take your high school or your teachers with you as you move forward in life, you can carry a class ring along with you anywhere you go. Small enough to fit in your pocket, discrete enough to wear on your finger, a class ring can be worn throughout your life to signify your accomplishments and pride in your high school years.